Universalists plan and build a church in East Middlebury but turn it over to the East Middlebury Methodist Church congregation in 1874. A small group of Unitarian Universalists meet at the Middlebury Community House but the group doesn’t survive. Through social and nuclear freeze networks, a group of six Addison County, Vermont UUs make connections with each other. They talk about the possibility of starting a new UU congregation in Middlebury, aware that an earlier, 1960-1969 UU fellowship hadn’t survived. 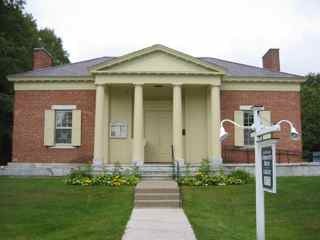 They collect names of local UUs, actual and potential, in a green, 3×5 card file box—Champlain Valley Unitarian Universalist Society’s birthplace! Founders contact Rev. Tom Chulak at the UUA. He recommends, “Begin as you mean to go on” with public services, at least twice a month. A group of eleven meet with Rev. Deane Starr, secretary of the NH/VT District, December 14, 1985, at Rich and Artley Wolfsons’ home in Weybridge. He provides advice and worship resources. 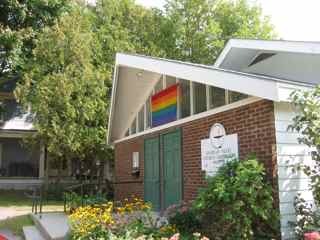 Twenty-two adults and children, including new UUs, visit First Unitarian Universalist Church in Burlington, December 22, for worship, a potluck, and an encouraging meeting with Rev. Robert Senghas. The group meets at the Bill and Abi Sessions’ home in Cornwall home to organize committees and plan a worship service. Newsletter begins. Bank account opened. First worship service, during a January 26, 1986 snowstorm, at John and Alice Berninghausens’ home in Cornwall. Public services, conducted by lay speakers and visiting ministers, begin every other week at Sarah Partridge House, East Middlebury. RE is organized. Bi-weekly services and RE continue. Further organization. Bylaws drafted and adopted. Formal affiliation with the Unitarian Universalist Association. Bi-weekly services and RE continue. Worried about space and potential leadership burnout, CVUUS votes to search for a part-time professional UU minister. Rev. Marc Estrin, a founder and first coordinator of Burlington’s Peace and Justice Center, is hired to serve CVUUS quarter-time. CVUUS moves to Cornwall Town Hall. Rev. 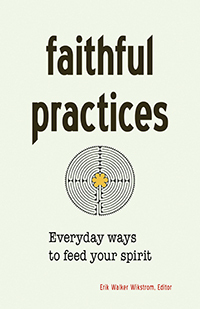 Marc Estrin initiates a period of creative approaches to worship, music, RE, and congregational participation. Congregation meets four Sundays a month—twice for worship, once for a social issues forum, and once for business. Controversy develops about the minister’s intense political orientation and lengthy, politically-oriented worship services. Congregation accepts Rev. Marc Estrin’s resignation. CVUUS returns to bi-weekly lay-led services (or three services a month?) with occasional visiting ministers. A dedicated, small congregation persists with hope and humor. An anxious but intrepid congregation worries about and hopes for its long term survival. Thirty-nine (39) people think boldly, plan carefully, and decide to buy a centrally-located Jehovah’s Witnesses building at the corner of Cross and Water streets in downtown Middlebury. CVUUS counts on a mortgage guarantee from the UUA. UUA rules (since changed) prevent the UUA from guaranteeing our mortgage because, without a minister, building costs would exceed their guidelines. 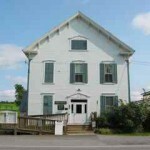 CVUUS moves to and celebrates its new location in downtown Middlebury. We return to weekly worship services. CVUUS begins to regain confidence, vitality, and members, thanks to very dedicated lay leaders and UU consulting ministers, Rev. Patience Stoddard and Rev. Mary Tiebout who commute from southern Vermont and New Jersey, respectively. The congregation gains greater strength, stability, and visibility in the community, still relying on visiting consulting ministers and talented but over-extended lay leaders. CVUUS votes to become a Welcoming Congregation. Carol Eagleheart writes “You Are Welcome Here” for CVUUS. Rev. Amy Zucker becomes intern minister. 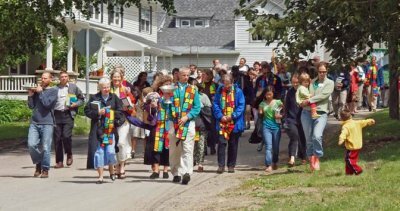 CVUUS applies and is accepted into the UUA’s Extension Ministry Program, which helps young UU congregations hire their first, full-time professional ministers. The program will offer financial support for three years on the understanding that the congregation will become financially self-sufficient and organizationally stable during that time. The congregation also manages to purchase a small house next door to use initially as a parsonage and to provide space for future growth. Trained in extension ministry, Rev. Johanna Nichols begins her first year at CVUUS, working under specific Extension Ministry guidelines. She helps CVUUS deepen its worship, develop lay leadership, become more coordinated and organized, provide more programs and services to the congregation, and reach out to the broader community. CVUUS also hires part-time staff: an office coordinator, a choir director, and an RE coordinator. Building Planning Committee is appointed to explore how to expand and enhance the sanctuary. Congregation votes on its first comprehensive plan. In the second year of Extension Ministry, CVUUS continues to experience a period of rapid change and growth, learning more about how to work with a full time minister. Comprehensive Planning Committee is appointed. The congregation votes to call Rev. Johanna Nichols as the first, permanent, full-time UU minister in Addison County. Rev. Johanna Nichols is installed officially as CVUUS’s minister. Parsonage becomes the RE House to meet the needs of a burgeoning religious education program. Committees form to study short and long-term space needs. Board and committees work on better coordination, new policies and procedures, and plans for accommodating future growth. The Board votes to offer two Sunday services with parallel RE programs in 2003-2004. RE House is shared with the Aurora School. Rev. Johanna Nichols transitions from extension ministry into collaborative ministry with CVUUS. Two worship services and RE programs begin amid considerable congregational anxiety about potential loss of intimacy and the impact of growth. For supplemental income, CVUUS rents RE House as family housing. RE program uses Mary Johnson Day Care center nearby. Two parallel worship services and RE programs continue. CVUUS votes to hire architects to design a new building for CVUUS in its current location, utilizing, also, “the parsonage” lot. Welcoming Congregation program is offered for a second time. RE program regains use of RE House. The congregation looks forward to the time when it can worship together in one service in a new building. CVUUS votes on building concept design and to launch capital campaign. The congregation also votes to build a wheelchair accessible bathroom near the sanctuary and takes up a special collection for it. Search for half-time DRE begins in spring. Wheelchair accessible bathroom is completed. Emergency exit steps repaired. Roof of RE house repaired. CVUUS begins a capital campaign with “We’ll Build a Home” as theme. Search for half-time DRE continues. Wiki is added to web site. Congregation has grown to 160 members. Congregation authorizes Board to purchase property on Charles Avenue for new sanctuary. Architectural planning begins for new sanctuary. Construction of new sanctuary begins on Charles Avenue. CVUUS volunteers renovate home next door to new sanctuary to house the congregation’s Religious Education program. 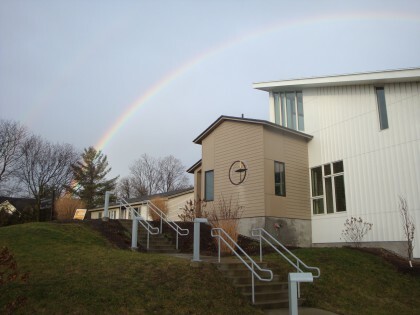 Last service and move to new meetinghouse, May 31, 2009. First service in new meetinghouse, June 7, 2009. New sanctuary dedicated September 27, 2009. Rev. Johanna Nichols retires from pastoral ministry, June 2010. CVUUS welcomes Rev. Emily Melcher as interim minister for two years. Ministerial Search Committee leads the congregation in search for new minister. CVUUS focuses on issues related to change, policy governance, and re-structuring. The Congregation votes, on Sunday, April 22, 2012, to call Rev. Barnaby Feder as its new minister. Rev. Emily Melcher concludes her two-year interim ministry with CVUUS on June 30, 2012, having been called to interim ministry by the Unitarian Society of New Haven, Connecticut. Rev. Barnaby Feder begins his ministry with CVUUS, August 1, 2012. His formal installation ceremony is celebrated on October 27, 2012. Poppy Rees appointed Interim Director of Religious Education. Poppy Rees becomes Director of Religious Education. Choir Director, Sue Borg, announces resignation. CVUUS Sangha, a Buddhist meditation group, is formed. Lucy Allen Tenenbaum becomes Choir Director. CVUUS Long Range plan is updated. Planning begins for completion of the ground floor.